CANTON, MA—Touting the beverage as the perfect drink for those frigid, gray November mornings, Dunkin’ Donuts unveiled a new seasonal Rotting Jack-O’-Lantern Latte Thursday to celebrate the end of fall. “Containing our signature coffee mixed with an artisan blend of freshly ground dead leaves and decomposing pumpkin chunks, our Rotting Jack-O’-Lantern Latte wonderfully captures the feeling of autumn drawing to a desolate, miserable close, leaving only the long winter ahead,” said Dunkin’ Donuts spokesperson Carolyn Wiseman, adding that the latte comes topped with random pieces of stale, crushed-up Halloween candy that have been sitting at the bottom of a trick-or-treat bag. “Our customers will just love the Rotting Jack-O’-Lantern’s seasonal aroma notes of pumpkin detritus, mothballed sweater, and burnt dust on a long-dormant heater, reminding them that another year is passing quickly by. 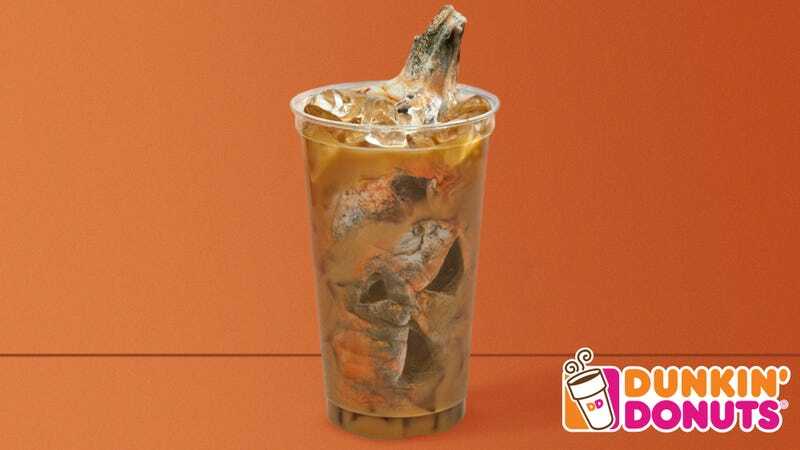 And for just 99 cents more, you can add an extra flavor shot of dirty sleet.” At press time, Dunkin’ Donuts added that it had decided to release the Rotting Jack-O’-Lantern Latte after the recent success of its seasonal Rank Body Sweat Coolatta to celebrate the month of August.